The Tipton Best Gun Vise is the best tool you can own for working on your guns. 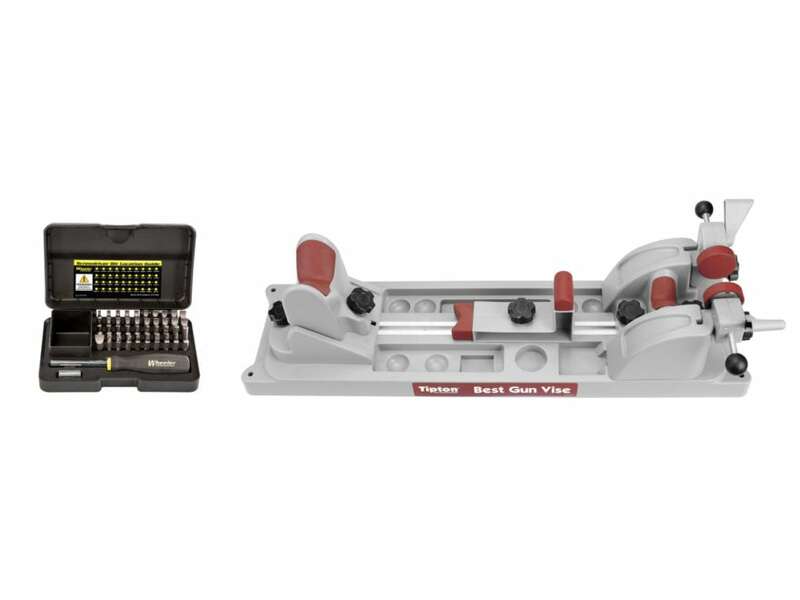 The vise was designed to accommodate the widest possible array of firearms for cleaning, maintenance, or gunsmithing, and is easily configurable to handle bolt-action rifles, break-open shotguns, AR-15's, and handguns. A central aluminum channel lets the user move individual components to the ideal position for their firearm. Each individual component then adjusts to the perfect position for secure support. The rear base features two adjustable offset clamps for a tight grip on a wide range of buttstock configurations. The Best Gun Vise is extremely stiff and is made from high-quality, solvent-resistant material that will stand up to years of hard use. The included Wheeler Engineering 43-Piece Professional Gunsmithing Screwdriver Set is a kit that belongs on every gunsmiths bench. The well thought-out bit selection will put an end to burred, buggered, busted up screw slots on any gun that comes your way. The bits make up the heart of any screwdriver set, and Wheelers are the finest available. They're made from S2 tool steel and hardened to 56-58 Rockwell C. The hollow-ground bits are gently curved as it reaches the tip instead of being straight to protect the fit and finish of the screw. The hollow-ground shape spread forces equally along the sides of the screw slot resulting in no damage. The 43 Piece Screwdriver Set features a very comfortable overmolded screwdriver handle to ease all of your work. Never lose a bit with the durable custom box that's ready for the bench or your range kit.